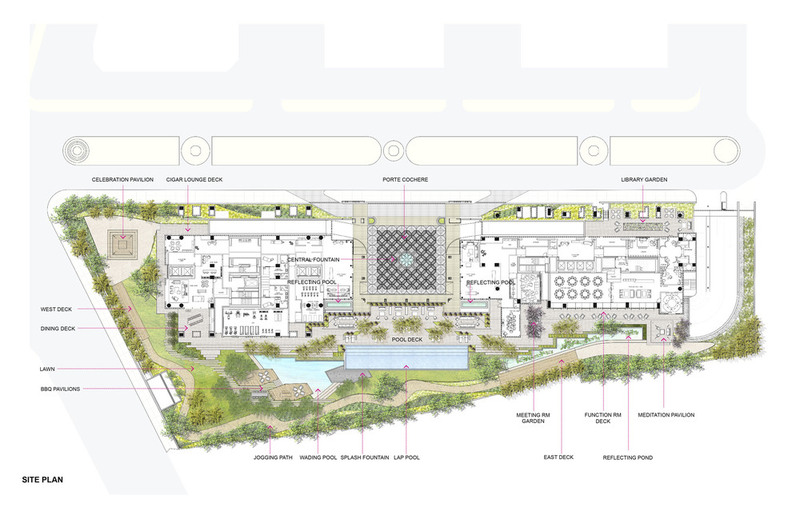 Despite the constrained and irregular site geometry and large building footprint, the design creates an expansive landscape filled with a variety of experiences and amenities for residents. A series of pavilions and features define the outdoor experience and create an infinite circulation loop. The centerpiece is the Infinity Pool and Pool Deck. The Deck wraps around the building to create easy access between the two towers and mediates between the orthogonal geometry of the building and the organic quality of the landscape. The entire deck cascades down onto lush landscape of tropical vegetation and water creating a seamless experience. Once within the garden, pavilions and landforms create journeys to explore the landscape. The Celebration Pavilion is a place for celebrations and special gatherings surrounded by lush bands of colorful vegetation. The specular quality of the underside of the roof reflects its surroundings, creating a dynamic experience. Adjacent to the Celebration Pavilion is the Children’s Play Area. Gentle undulating mounds create a surface for dramatic play with parents sitting on the deck ledge. As one continues on, one arrives at the Central Lawn that is spatially defined by a gentle hill which serves as an informal seating area shaded by broad canopy trees. The Lawn leads to the BBQ Pavilions which hover over the Wading Pool like piers over water. These pavilions can accommodate one large family or 2 small groups. Continuing on the stone steps within the lawn, one arrives at the Wading Pool and Splash Fountain, conceived of for children with adjacent lawn for family picnics. On the undulating path, which doubles as a jogging path, one arrives at the Meditation Pavilion overlooking the reflecting pond. From there, one continues back on to the Deck. A large roof garden for all residents and two penthouse gardens offer spectacular views over the city. Tina was the lead project designer and manager through concept design to design development while at swa.